The chart below allows you to check the price of palladum today or historical prices dating back 20 years. Hover over the chart to see the spot price for that particular day. Add this chart to your website! Add spot prices to your website! Palladium has broken through into investor awareness in recent years. The “new white metal” is increasingly in demand in applications ranging from jewelry to automobile catalytic converters. 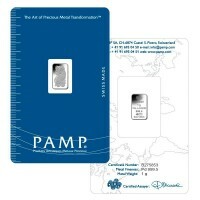 The result has been an extraordinary rise in prices, making palladium the best performer among the precious metals. 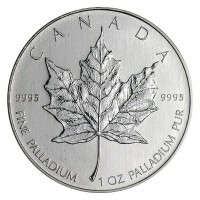 Palladium is an extremely rare, silver-white precious metal. It is 30 times more scarce than gold, and it is 15 times more rare than platinum. Palladium was discovered in 1803, but mineable ore deposits are not easy to come by. Much of the current production is confined to Canada, Russia and South Africa. The latter has become a difficult jurisdiction for miners to operate in. Labor unrest and electrical outages are increasingly common there. Russia is the leading producer, mining roughly half of the current annual production of 200,000 ounces. Approximately 30% of supply comes from South Africa. 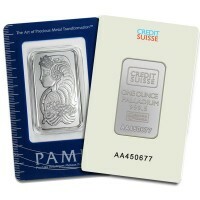 Palladium is one of three platinum group metals available in the bullion markets. Platinum and rhodium are the other two. These metals share similar chemical properties, but Palladium offers the lowest density and the lowest melting point of the group. More than half of the Palladium mined is used in automotive catalytic converters which have been mandated as part of an effort to reduce harmful emissions. Catalytic converters change noxious gases including hydrocarbons, carbon monoxide and nitrogen dioxide to more benign nitrogen, carbon dioxide and water vapor. Each catalytic converter requires approximately 1/20th of an ounce of a platinum group metal. 2016 worldwide vehicle production is estimated at 72 million, so you can see how demand for palladium, platinum and rhodium really adds up. Palladium has also gained popularity as an investment vehicle. A variety of mints and refiners are producing coins and bars for retail sale and ETFs have been formed to satisfy demand from institutional investors. 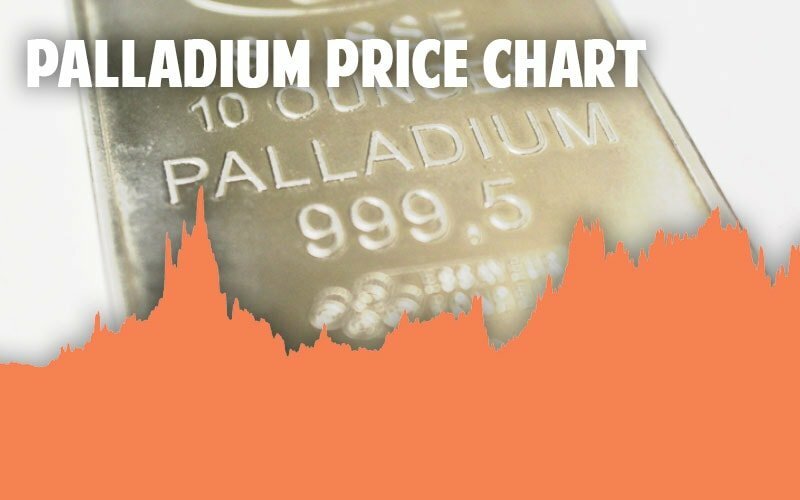 The price history of palladium is fascinating. The metal began moving out of relative obscurity in the 1990s as automakers found it to be a great alternative to more expensive platinum. Prices accelerated upwards and peaked at over $1000 early in the year 2000. The run upward in price was followed by a precipitous fall and the metal spent most of the next decade trading under $400 per ounce. Its fortunes changed in 2008 as interest in precious metals as a safe-haven began to surge. The precious metals complex put in a bottom in Dec. 2015 and, to date, Palladium has been far and away the best performer in terms of price. The price per ounce eclipsed that of platinum for the first time ever in 2017. The metal rode a wave of increased investment demand coupled with a recovery in the automotive manufacturing sector worldwide. The term “ Spot price” for palladium (and other precious metals) refers to the current price of the metal as it is traded via contracts in the futures markets. Technically speaking the spot price is the price of the most recent trade, for a contract with the nearest available delivery date. The “spot price” is a paper price. Very few futures contracts result in physical delivery of the metal. Those contracts also have lots of built in leverage. 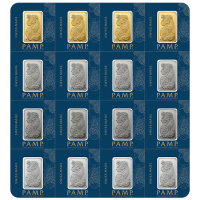 Often dozens, or even hundreds of paper ounces get traded for every ounce of physical Palladium bars in the exchange inventory. 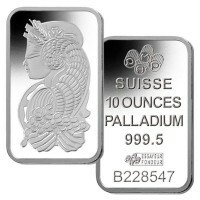 Palladium bullion coins and bars cannot actually be purchased at the spot price. The retail products are much smaller than the 100 oz bars held in inventory at the COMEX and other futures exchanges. The cost of fabricating, and shipping these smaller products are included, along with the metal dealer’s profit, in a premium that retail investors pay in addition to the spot price. The spot price is the price investors generally see published online or in the newspaper. What Is the Difference Between an “Ounce” and a “Troy Ounce”? This is an important distinction to make because it is the price per troy ounce that matters when it comes to palladium and other precious metals. A troy ounce is heavier than a “standard” (avoirdupois) oz. A troy ounce is the equivalent of 31.1 grams while a standard ounce equals 28.35 grams. There are 14.5833 troy ounces in a standard 16 oz pound. 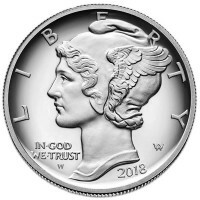 The troy oz is the default unit of measurement for gold, silver, platinum, palladium and rhodium in North America, the United Kingdom and elsewhere. It is important for investors to understand there are really two prices for palladium and other metals; a “bid price” and an “ask price” . “Bid price” refers to the amount that a buyer (generally a market-maker or dealer) will pay for the metal when a client wishes to sell. The “ask price” is the price clients pay when they wish to buy. The difference between these two prices is called the “spread” or the “ bid-ask spread ”. It represents the dealer’s or trader’s profit margin. This spread represents the transaction expenses for a “round trip” – the cost of buying the item now and selling it later. Smart investors pay attention to bid and ask prices and look for dealers, such as Money Metals Exchange, who offer very low spreads. Here on this site investors can see both prices updated live on all of the product pages. Palladium makes a lot of sense for bullion investors looking to diversify their holding. Recent history is a good example of how diversification can work. The metal dramatically outperformed silver, gold and platinum in 2016 and 2017. The palladium price doubled from its bottom near $500 per ounce while silver prices gained roughly 25% and gold added about 20%. 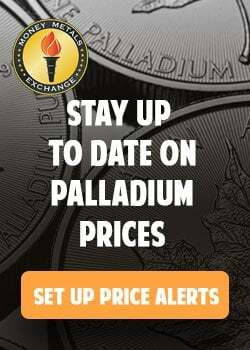 The fortunes of palladium will be tied more closely to industrial demand than gold and silver. The latter two are monetary metals and will respond to strength or weakness in the US dollar and concerns over monetary policy, federal spending and debt. For investors who have built a position in gold and silver and want exposure to a slightly different set of fundamental drivers, palladium may be the way to go. Precious metals are valuable because they are difficult to find and difficult to produce. Palladium is far more scarce than gold or silver. As its utility in industrial applications grows, and investor awareness increases, the setup is there for supply to fall short of demand. Palladium’s extraordinary scarcity could translate into exceptional price gains.